The brilliant golden yellow leaves of the Ginkgo trees flanking the back entrance of our local post office, once they are ready to fall, will drop in a few hours time, raining from the thick branches like small fans twirling from the sky. After our first hard killing freeze last night, the Ginkgo leaves fell today. The same Ginkgo tree on 13 November 2013, minus its leaves. The shriveling fruits, which look like half-sized wild persimmons, may persist for a few days after the leaves, then fall to the ground. Fruits are always a tempting curiosity. In fact, you can buy Ginkgo seeds as a food item in Chinese markets, but these have been prepared and processed to render them safe to eat. You should not be tempted to pick-up the freshly fallen fruits, which will cause contact dermatitis similar to the rash produced by poison ivy. The fruits have a fragrance that has been described as a blend between baby vomit and what a dog might leave on a sidewalk. That should be enough to entice you to leave them be. I suspect that these trees were planted about the time the Eureka Springs Post Office building was completed in 1918, rather than in 1973 when the building was expanded and the service parking lot in the back was developed. The trees are of a fairly good size, plus for many decades most ginkgo trees available from nurseries in the United States have represented male branches grafted on to rootstocks. Within forty years after Ginkgos were widely planted as a street tree by the mid 1800s, female trees like those at Eureka Spring’s Post Office began to leave their bad smelling fruits on sidewalks. 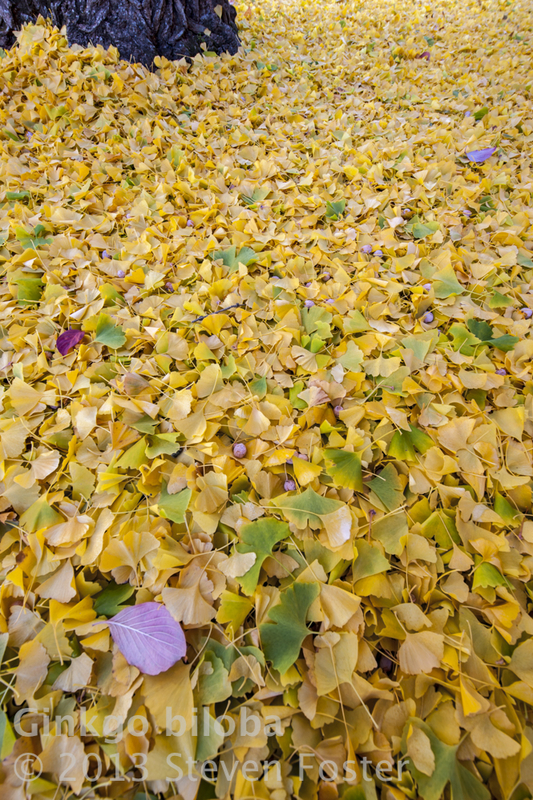 Female Ginkgos are simply not a neat and tidy street tree. Notwithstanding the beauty of the fall foliage, the fact that these two trees are females makes them a unique and interesting part of Eureka Springs’ heritage. 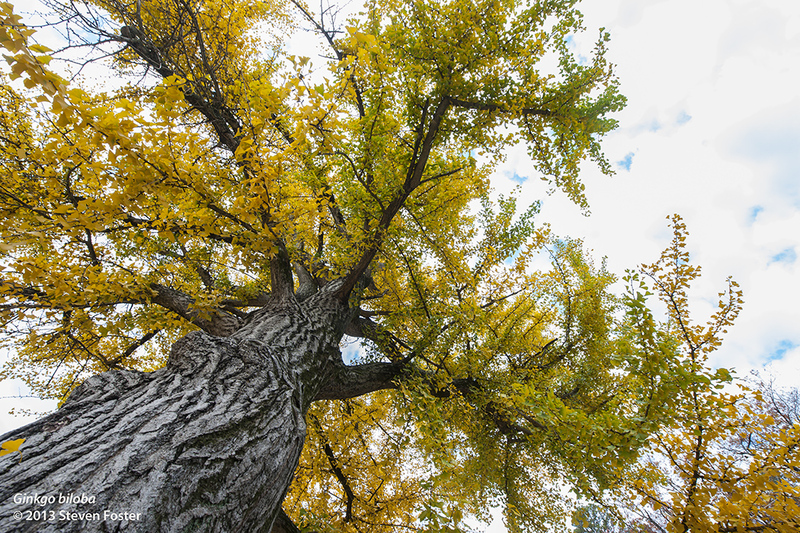 Ginkgo was common 175 to 200 million years ago, when dinosaurs roamed the earth. This primitive tree is considered the oldest living tree species on earth. Ginkgo is monotypic. That is, in the ginkgo family there is only one species in one genus — the only surviving member of the ancient and primitive ginkgo family—Ginkgoaceae. 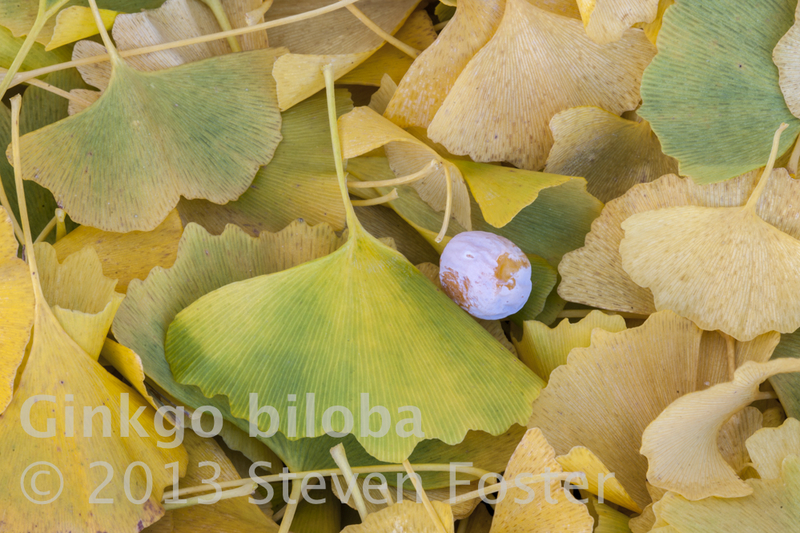 Ginkgo has been cultivated in East Asia for hundreds of years. Numerous reports mention the existence of large specimens, some more than a thousand years old, at ancient temples in Japan and China. The tree was first introduced to North America in 1784 in the garden of William Hamilton at Woodlands near Philadelphia. Mature ginkgos are said to reach over 100 feet in height. Its longevity as individual trees and a species in general can in part be attributed to its exceptional resistance to pests and resiliency to destruction by fire. It is also extremely tolerant of air pollution thriving in the harshest urban environments. Ginkgo leaf extracts are highly complex, highly concentrated preparations with an average ratio of 50 parts ginkgo leaf to one part of the finished extract by weight. Numerous chemical constituents are found in the extract. Normally ginkgo leaf extracts are calibrated to contain 24 percent flavone glycosides (but may range from 22 to 25 percent) which are a relatively ubiquitous group of compounds found in numerous plant species. Another important compound group in ginkgo leaf extracts are mostly unique to ginkgo — the ginkgolides — including ginkgolides A, B, and C (around 3 percent) and bilobalide (also about 3 percent). 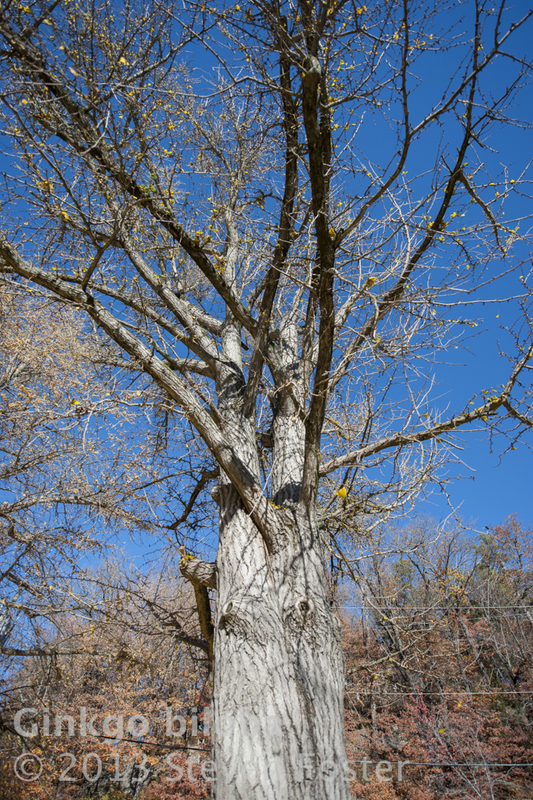 As the oldest living tree species on earth, it is no surprise that it would harbor chemical components rare in nature. Perhaps these extremely complex, large molecules have helped it survive for eons. In addition, during the manufacturing process another group of compounds, ginkgolic acids, which are perceived as potentially toxic, are reduced to below 5 parts per million. Given the specific chemical make-up of ginkgo leaf extracts, it becomes clear why you can’t apply the results of studies with Ginkgo leaf extracts to a simple tea made from ginkgo leaves. Numerous pharmacological and clinical studies on Ginkgo leaf extracts have demonstrated a positive effect in increasing vasodilation and peripheral blood flow rate in capillary vessels and end-arteries in various circulatory disorders, varicose conditions, post-thrombotic syndrome, chronic cerebral vascular insufficiency, short-term memory improvement, cognitive disorders secondary to depression, dementia, tinnitus, vertigo, antioxidant activity, among other effects.